A wave of anger against a US decision to recognise Jerusalem as Israel’s capital has spread from Asia, through the Middle East, to North Africa, with tens of thousands of people taking to the streets to denounce the controversial move. Protesters filled central avenues and squares in a number of major international cities on Sunday, waving the flag of Palestine and shouting slogans to express their solidarity with the Palestinians, who see East Jerusalem as the capital of their future state. 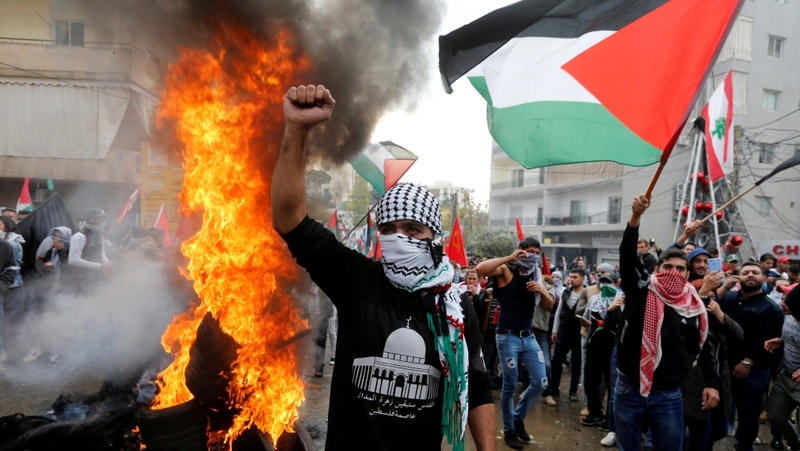 US President Donald Trump’s announcement on Wednesday drew near-universal condemnation from world leaders and inflamed the Palestinian-Israeli conflict, with violence flaring up in the occupied Palestinian territories for a fifth day. According to the Palestinian Red Crescent, 157 people were injured on Sunday in confrontations with Israeli forces in the occupied West Bank, Jerusalem and Gaza. At least four Palestinians have been killed in the Gaza Strip since the US declaration. Clashes also erupted on Sunday at a protest in Beirut, where demonstrators fought with security forces outside the US embassy in the Lebanese capital. Demonstrators set fires in the street, torched US and Israeli flags and threw stones at police officers, who responded with tear gas and water cannon. Adnan Abdullah, a protester in Beirut, said Trump’s Jerusalem decision “will not happen as long as there are people like us”. Another demonstrator, whose face was hidden behind a black mask, held up a tear gas canister and condemned Lebanese forces for “defending America”. Arab foreign ministers, in a resolution on Sunday, urged Trump to rescind the decision and have called for a UN Security Council condemnation of the shift in US policy. Meanwhile, more than 5,000 Indonesians rallied outside the US embassy in Jakarta to vent their anger for a second day. Protesters carried Palestinian flags and banners saying “Pray for Palestine”. Another female protester in Jakarta urged Trump to “use his brain” and “withdraw from Jerusalem”. Indonesian President Joko Widodo has condemned Trump’s decision. On Thursday, he ordered the US ambassador in Jakarta to be summoned over the move. 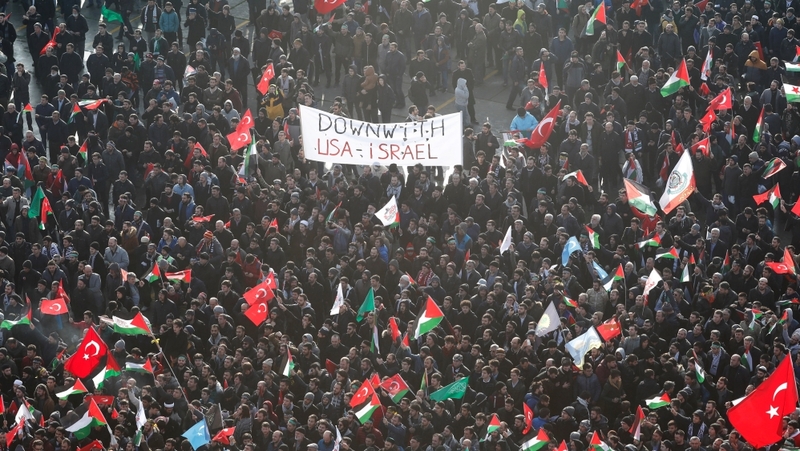 In Turkey’s Istanbul, thousands of demonstrators took to the streets again, transforming the city’s Yenikapi Square into a sea of Turkish and Palestinian flags. Turkey’s President Recep Tayyip Erdogan, one of the most vocal critics of Trump’s move, has called the declaration “null and void” and vowed to fight it. He has also called a summit of Islamic countries to discuss the move on Wednesday. 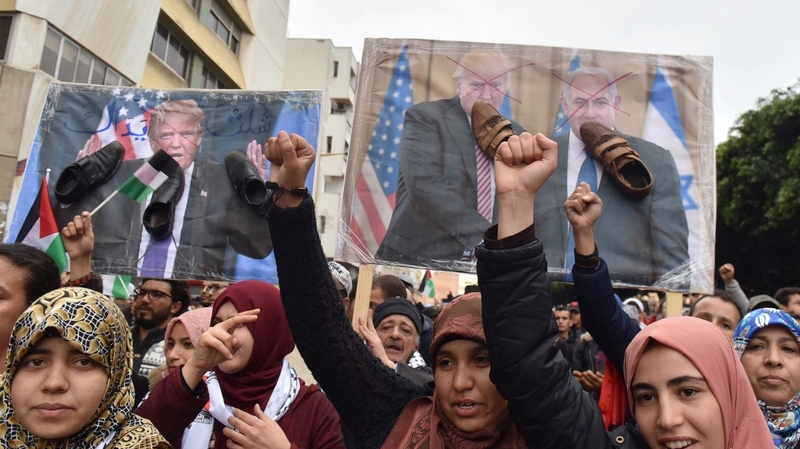 In Rabat, Morocco’s capital, protesters yelled slurs against Trump and carried banners saying Jerusalem belonged to Palestine. Al Jazeera’s Hashem Ahelbarra, reporting from Rabat, said the protest was “a show of solidarity with the Palestinian people but also an opportunity to express anger” over Trump’s decision. Mohamed Boussaid, Morocco’s finance minister, said the demonstration was a way “to express our indignation and un-satisfaction” and to show that “we refuse completely the decision taken by the president of the US”. Jerusalem is home to Islam’s third holiest site and its status is deeply sensitive for Muslims. In Indian-administered Kashmir, protesters took a different approach. Residents of the capital Srinagar, home to 1.1 million people, closed their shops and abandoned the streets in protest. Salman Khan, a Srinagar resident, told the ANI news agency that Trump’s decision was “completely unjust”. Muslim solidarity with Palestine also spread to the war-torn nations of Yemen and Syria. Further protests were held in Egypt, where students and professors demonstrated at the Al-Azhar university. In Pakistan‘s Karachi, hundreds of protesters marched towards the US Consulate in the city, but were turned back by riot police. Previous article Thor Vs The Hulk: Who Is The Stronger “Ragnarok” Avenger?